Not long after speaking with Troian Bellisario, we had the chance to be part of a Q&A with another Pretty Little Liars star, Ian Harding. 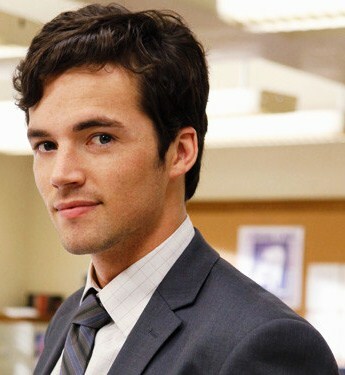 Ian plays Ezra Fitz on the popular ABCFamily show. Ezra is an English teacher who is in a relationship with Aria, one of the main four girls on the show. - He really enjoyed shooting a particular upcoming episode, but because giving any explanation would give away some spoilers, he wasn't able to say much. Everyone had a good time, things were loose on set, and it was just fun to shoot. - Another girl (or girls) will have an impact on Ezra & Aria's relationship. No more information was given, though! - Ian believes that there's no way that the show could continue for a whole other season with Ezra in the dark about who "A" is. - If he could, Ian would give Ezra a whole book of advice! He'd tell him to follow his heart, among other things. - Ian's character hasn't interacted much with Torrey's or Sasha's, but he'd love to do scenes with either of them if it ever works out that way. - Though it's probably not in the cards, some guest stars Ian would love to have on Pretty Little Liars include Carey Mulligan, Marion Cotillard, Christopher Plumber, Ewan McGregor, and Jesse Tyler Ferguson. - When he receives a new script, he only reads his parts first. Then, at the first table-read, he experiences the entire episode for the first time while the entire cast is reading. There's usually something shocking in the episode that results in him having his jaw on the table the entire time. "Each episode, my jaw goes progressively lower to the floor." - He hangs out with Torrey DeVitto and Keegan Allen off-set. - The biggest challenge for him as a television actor (he did live theatre previously) is to not over-think things and just "let go and surrender to the situation, to the moment." - The Ezra character reads a lot. Ian likes to read as well and has recently finished Painters. The next book on his agenda is Just Kids by Patti Smith. He likes to read everyday so that his mind doesn't go "to mush." - Other things Ian likes to do include cooking, hanging out with friends, and seeing movies. He LOVES movies. He makes a good shortbread and does a raw beet and pear salad with mint. A while back he did an extremely tender standing rib roast. - If he wasn't an actor, Ian would probably be a psychiatrist or be doing manual labor. - As a guilty pleasure, he likes to watch Bully Beat Down. - He has been auditioning around Los Angeles, although there really are no breaks in the filming schedule for Pretty Little Liars until December. - He's not too familiar with Twitter yet. When his name and that of his character were trending, he didn't understand the significance at first. But he now knows that it's a worldwide thing and it's cool. He feels blessed and thinks that Twitter has really helped with the show's popularity. That's it for today! Thanks again to ABCFamily and New Media Strategies for the opportunity to chat with Ian Harding!